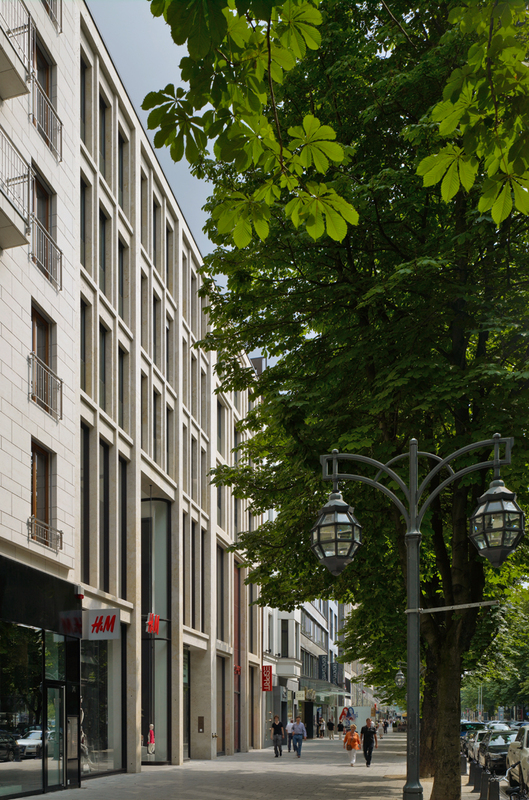 An urban gap between Königsallee and Huschbergerstraße, along the banking and shopping street in the Karlsstadt district of Dusseldorf was recently filled with a new building. 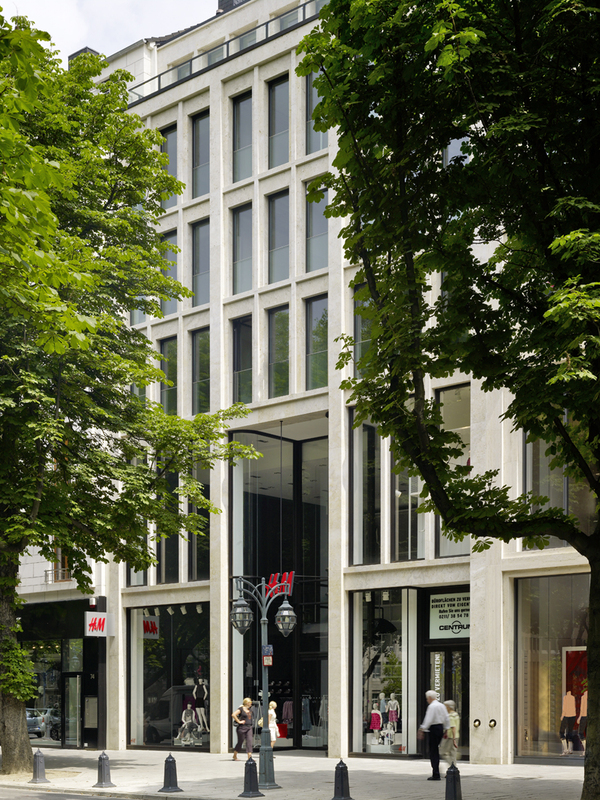 The six-storey office and commercial building has two penthouse flats as well as two commercial storeys that connect to Huschbergerstraße. 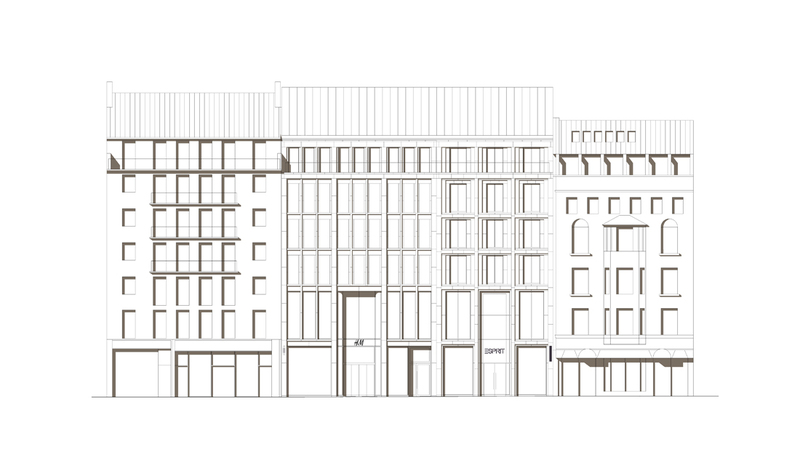 Both the 5.0 m tall ground floor and the basement will be occupied by the new Esprit and H&M flagship stores. There are three floors of office space above, each having 400 m² of usable floor area and conceived as a law office or medical practice. The recessed penthouse storey and the larger storey below it house the generously distributed apartments. The underground garage is reached by car lift from Huschbergerstraße. 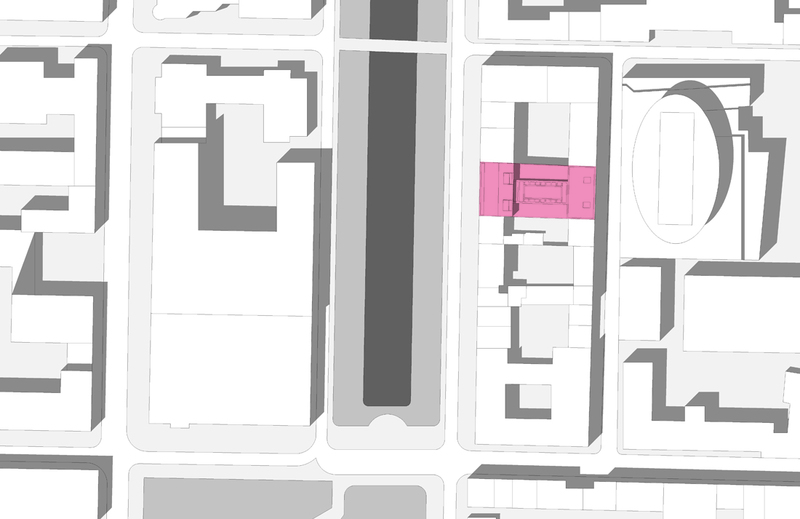 In accordance with the historic urban layout along Königsallee, the building features two different façade designs. This maintains the vertical proportions of building and façade within the city’s built environment and, at the same time, both flagship stores receive independent architectural identities. 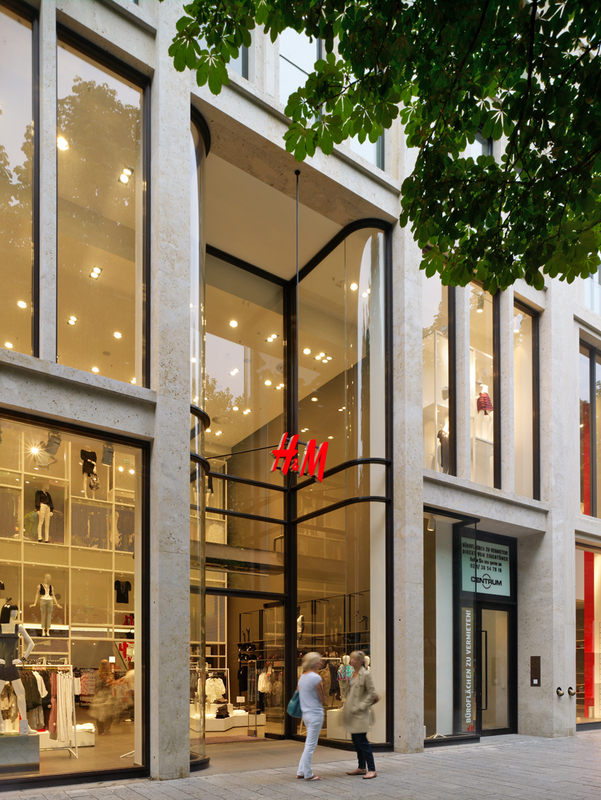 The Königsallee façade of H&M is structured by pillars and pilasters made of coral limestone and provides a high degree of transparency. It illustrates the interior uses by way of the structural division into base, middle and top of the building. The architectural bronze of the window frames and the recessed two-storey entrance, featuring arched display windows, confer the building with a classical yet worldly character. The Esprit façade also utilizes the principle of structural division into base, middle and top of the building, however the highly three-dimensional vertical structure of the perforated façade gives it a very different appearance. 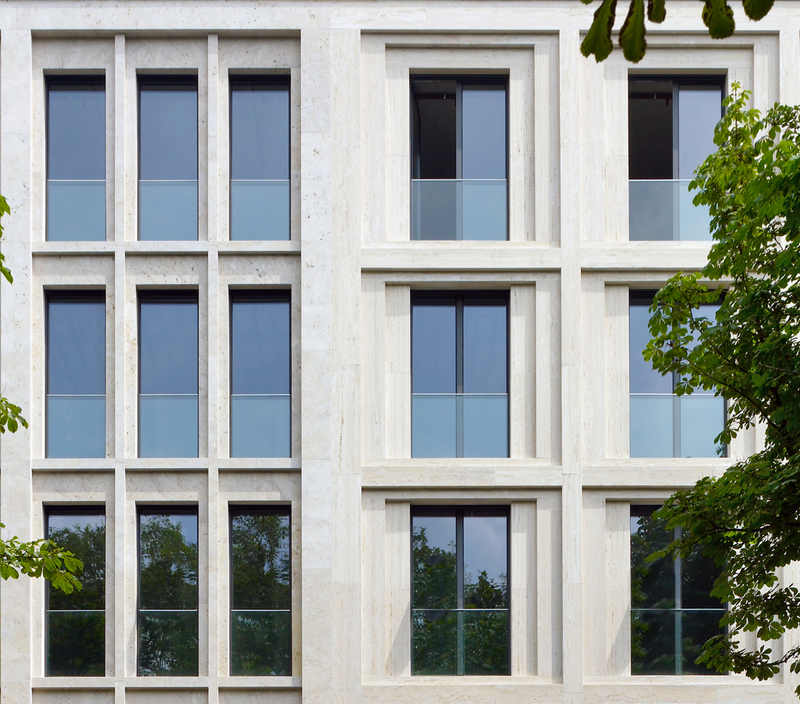 The choice of materials – Roman travertine and anthracite-coloured window frames – underscore the façade’s independent character. However, the principle of structural division, the colouration of natural stone and the detailing still connect both façades as part of an ensemble. Much value has been placed on being true to materials and sustainable workmanship. The natural stone cladding is massive, and has also been installed without joints where possible, to underscore the dignified character of the buildings.